The Sunny Isles Beach Social Seniors Events (SSE) has changed its name to the Social Citizens of Southeast Florida (SCS). Dennis P. Stubbolo after five great years as President of (SSE) still retains his title as President of (SCS) and the organization is generously funded from The Sunny Isles Beach Foundation, led by the former Mayor of Sunny Isle Beach: Norman S. Edelcup. The SCS organization is one of the largest clubs in Broward and Miami- Dade County. The mission is to Educate, Entertain and Socialize so all their members can and will have a good time in whatever they partake in. The SCS remains a 501c3 Non-Profit/Non Political organization that caters to its adult population in the community. The club will focus on educating, entertaining and socializing through Luncheons and trips and it will now include all adult age groups, plus it will add to its programs political presentations without specific endorsements, under the leadership of our Director; Norman S. Edelcup. Annual member's dues are only $20.00 Per Year. The educational & entertainment programs usually take place at popular restaurants like Duffy's in North Miami Beach, Olive Garden in Aventura and Tony Roma's in Sunny Isles Beach. This also includes a delicious lunch or dinner for a nominal fee. The programs are put on once or twice a month with either entertainment or educational; and always Social, with food and refreshments; plus we give our members a more meaningful life in the community. The educational programs are with doctors, authors, politicians, educators so as to inform our Social Citizens of what is going on in our area - Miami-Dade and Broward Counties. The organization goes on trips in the Winter Season that are educational to learn about different parts of our great state of Florida. 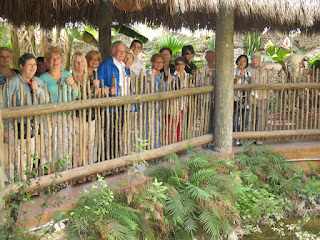 On these trips, the members get to learn about the history, customs, food, people, sights and sounds of our great state. Some of the trips planned for this Season are going to be (Coming Soon). Our deluxe buses are always air-conditioned with restrooms and each trip includes a lunch and a guaranteed great time. By combing resources with The Sunny Isle Beach Foundation, we now wish to create a platform for emerging artists, musicians, performers and writers in our community. This will give our members and all who come to see this new local talent much joy and enhance the lives of all it touches. We will also be involved with providing scholarships to deserving high school students. These events will be led by our Vice President: Lewis J. Thaler. Our Officers and Board of Directors of the SCS is excited by these new plans and look forward to enhancing the lives of all our members and our expanded community.